Nelson Karre is an attorney and shareholder of the Firm. He was born in 1952 in Omaha, Nebraska, obtained his undergraduate degree in 1973 from the University of Wyoming and graduated in 1977 from the University of Nebraska Law School. Nelson joined the Firm in 1977. Nelson's practice is primarily in real estate, estate and business planning, municipal law including zoning and development work, and trust and probate administration. He has worked on numerous civil litigation matters in a variety of courts including commercial and real estate matters and trust and probate claims. 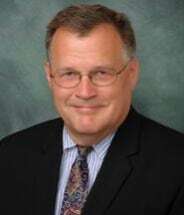 He has also worked extensively with local units of government on economic development projects in the greater Battle Creek area. He has been instrumental in the development of Battle Creek's Beckley Road commercial/retail area including Lakeview Square Mall, and the redevelopment of Battle Creek's downtown. Nelson is active in a variety of community service and nonprofit organizations, including as a board member of the Battle Creek Tax Increment Finance Authority, the Bronson Healthcare Group, Bronson Battle Creek Hospital, and formerly the Battle Creek Chamber of Commerce the Irving S. Gilmore International Keyboard Festival, and the United Arts Council. Nelson and his wife, Nancy, have four children.